This is a simpler version of the Mother of all Werkstatt Mods. The interface uses the existing Werkstatt keyboard hardware by taking over the clocking of the keyboard counter. Connecting Midi Keyboard Interface to Werkstatt. The power wiring a straight forward. You are connecting the wires to test points designed for this. Heat test point and apply a little solder. Tin wire and hold against test point. Apply soldering iron. Once solder has melted you should be able to remove the iron and the joint should be good. There are five control wires. The one that has a resistor with some heat shrink is pin 1. The end of the resistor is connected to TP14 on the Werkstatt. 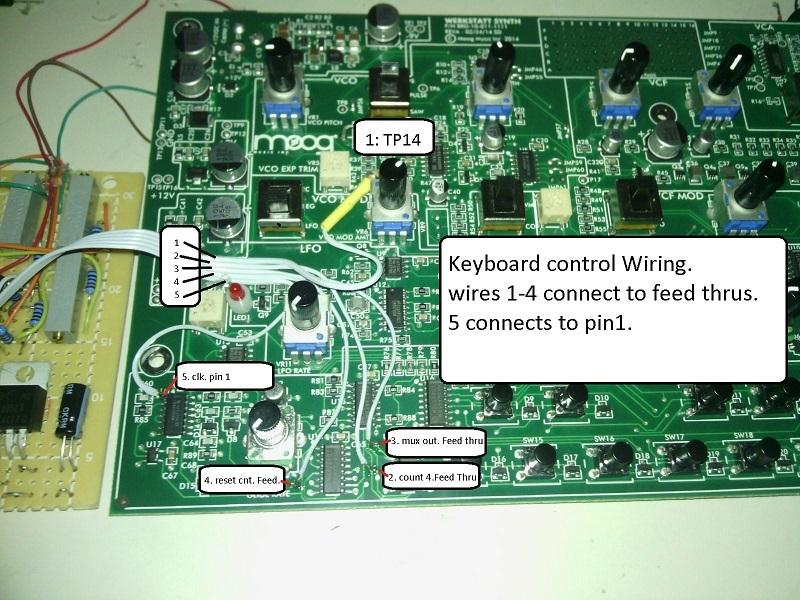 Wires 2,3 and 4 are connected to feed thrus on the board as marked. To make a soldered joint with the feed thru, place the soldering iron on the feed thru to heat it up and apply a little bit of solder. Find a spare resistor and tin the lead (heat it up and applu solder to it so it has a fresh coat). Now heat the feed thru and poke the tinned resistor lead thru the hole. Clip off the lead to about a tenth of an inch. This gives something to easily connect the wire too. The hardest one to connect is wire 5. This has to be soldered to pin 1. What I do is place solder against pin 1 and quickly heat till it melts and remove heat. this 'tins' the lead. Make sure the end if the wire is neat, short and tinned. You only need about a 20th of an inch. 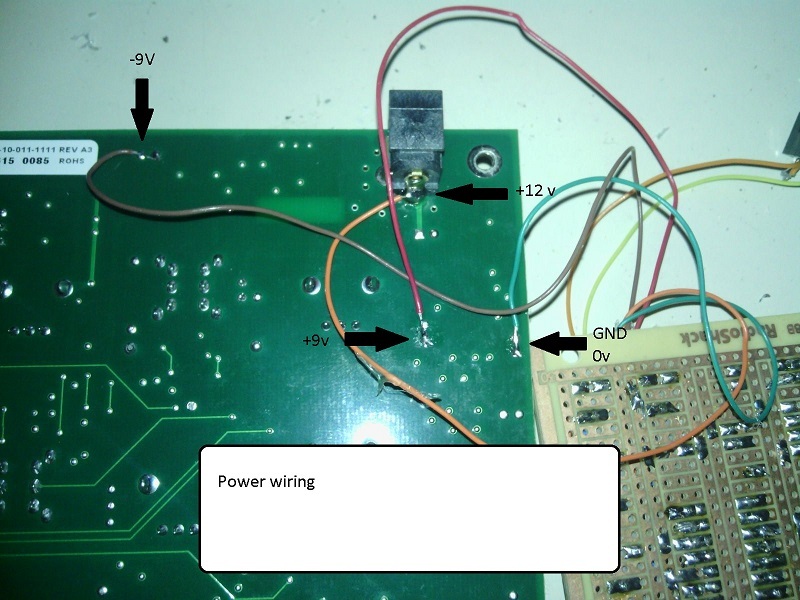 Place the wire against pin1 and apply the soldering iron. One the solder on the wire melts, you should be able to remove the iron and the joint should be ok. You are trying to minimize the amount of heat to pin 1. The TP 14 on the Werkstatt is a virtual earth summing input. Three multi turn (22 turn) presets are used to provide a +1 octave shift, a +2 octave shift and a -2 octave shift. This gives the Midi interface a 6 octave range (-2, -1, 0, +1, +2, +3 ). Three digital output pins are used to activate the three presets. Two are summed and inverted. 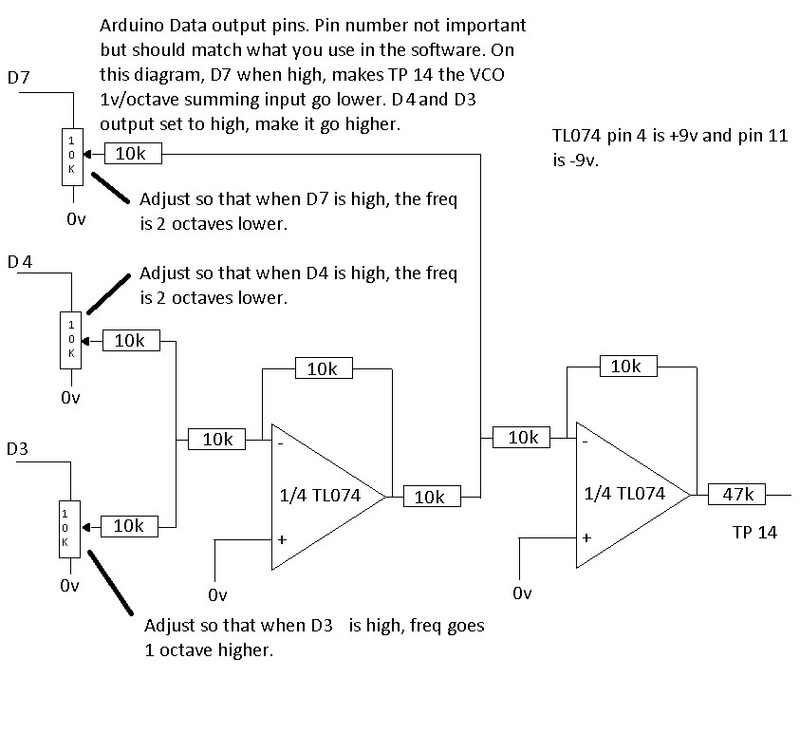 One is summed with the inverted value and the combined value is inverted again and sent to the VCO input. Simple tune player. Parts used by Arppegiator. A simple software virtual machine. Header with sound sound stuff. Header used by okay and main routines. All of the above as a single zip archive. The Midi interface is listening on Midi channel 1. The note range is C1 - D#7. With the board connected, the Werkstatt keyboard should work as normal. When you press a key, the led on the control board should turn on. If you press more than one key, the notes will be arppegiated in the order pressed.